For suspension cranes, the bottom chord of the runway girder is subjected to local flange bending due to the wheel loads in addition to the main load bearing capacity. The bottom chord behaves like a slab due to these local bending stresses and has a biaxial stress condition . Particularly for the calculation of the effective length according to , Table 6.2, the location to design in the runway girder as well as the axle base of the wheel loads have to be considered. For the design of suspension cranes in the serviceability limit state according to , it is necessary to determine the local bending stresses in the lower flange due to wheel loads according to , Chapter 5.8. The calculation of the necessary coefficients is carried out according to , Table 5.2. According to NCI (Germany) on Chapter 5.8 of EN 1993-6, it is allowed to reduce the local stresses to 75 % for this superposition. This design verifies the elastic behavior of the lower flange. There are different methods to determine the local stresses in the lower flange which are also shown in . In , the calculation according to the FEM guideline 9.341 "Local girder stresses" has been taken over. The stresses are calculated here at the local points 0, 1 and 2 as shown in Figure 01. Several factors have to be considered for the design of the lower flange. 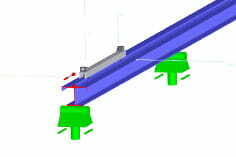 The designed location in the runway girder plays especially an important role for the determination of the effective length. Furthermore, the axle base of the wheels is important because the wheel loads and their local stresses may be superpositioned in case of small distances.